The brass industry in Waterbury began in the mid-18th century and provided an alternative for people struggling to make a living off the rocky, exhausted soil. In 1802, Southington brothers Abel and Levi Porter moved to Waterbury and joined pewter button makers Henry, Silas, and Samuel Grilley to form Abel Porter and Company, the first rolling brass mill in the US. Brass ingots from old copper kettles and stills were alloyed with zinc and sent to iron mills in Litchfield for rolling into sheets and then returned to Waterbury to be finished by horse-powered steel rollers. The Porter brothers were likely the first in the US to make brass using this direct fusion of zinc and copper. 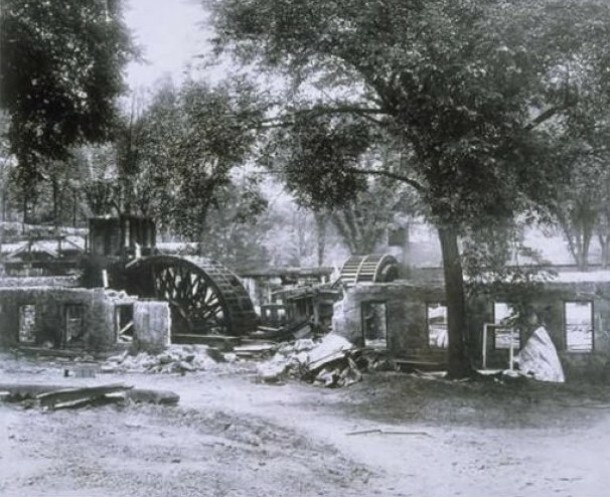 The demand for military and other uniform buttons in the mid-18th century led to the building of a water-powered mill and increased mechanization. By 1864, individual machines in the factory capably produced 216,000 buttons per day. By this time, the gilt button business of Abel Porter and Company had been purchased by James Mitchell Lamson Scovill, a fifth-generation descendant of one of Waterbury’s founders, Sergeant John Scovill. Along with Frederick Leavenworth and David Hayden, James Scovill formed the foundation of what later became the Scovill Manufacturing Company. 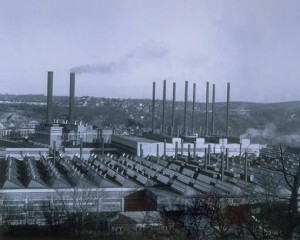 Scovill Manufacturing became Waterbury’s largest employer and, along with both American Brass and the Chase Brass & Copper Company, made up what local residents referred to as the “Big Three” of brass production. Together, these companies made Waterbury the leading producer of brass in the world. After reaching unprecedented heights of production during World War II, the brass industry in Waterbury began a steady decline in the 1950s. Plastic, zinc, and aluminum replaced brass in household products. In addition, mono-industrial regions began a sharp decline as the age of large, national corporations took shape. The troubled US economy of the 1970s only exacerbated the local brass industry’s problems, as did cheap labor and new technologies found overseas. Eventually, the Big Three ceased operations rather than incur the prohibitive expenses of trying to refurbish their operations.